The scoring opened up with the teams trading field goals, but late in the second quarter RB Devonta Freeman would score the game’s first touchdown. Shortly before the end of the half, RB Jordan Howard would respond with his own rushing touchdown to leave the game tied at half. The Falcons would pull ahead with two field goals and an TE Austin Hooper touchdown catch from QB Matt Ryan against a RB Tarik Cohen touchdown catch from QB Mike Glennon. The Bears would ultimately fall short, losing 23-17 to the Falcons. With that, we give you our PFF exclusive takeaways from the contest for each team. The reigning league MVP had a season debut that won’t rank high on his list of best efforts, but if nothing else he never looked in danger of giving up a turnover despite being pressured on a third of his dropbacks. The numbers are skewed with the big bust for his lone touchdown as Ryan was just a little bit off target a little too often to get the offensive juggernaut rolling. The most important battle of training camp was who would replace the retired Chris Chester. Up first, and I say first because more efforts like this and it won’t last, is Schweitzer, the sixth-round pick from 2016. He had a day to forget as Akiem Hicks worked him over and by the end of the day he’d been beaten for a sack, hit and hurry. More total pressures than the rest of the line combined. 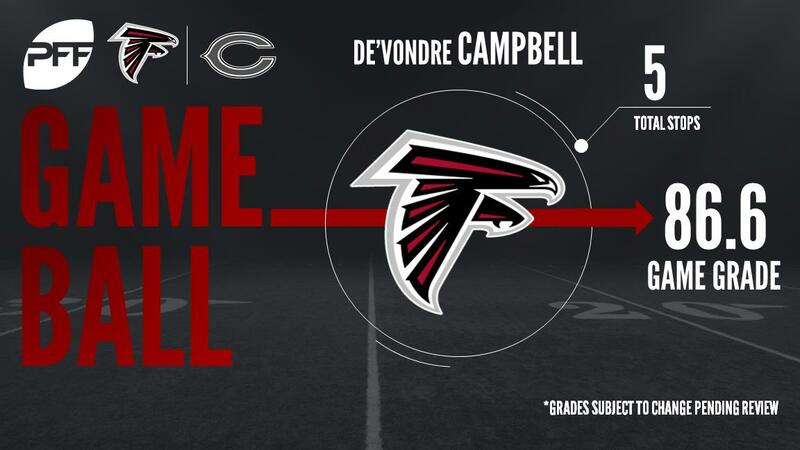 There is a lot expected out of Campbell now in his second year and if this effort is anything to go by he’s ready to take his game to the next level. He led the unit with five defensive stops, picked up a nice pressure on a starting left tackle and made arguably the play of the game to track speedster Tarik Cohen and prevent a touchdown in the endzone. If you’re hoping to see a lot of McKinlay early in the season you may be disappointed. He is ticketed for pass-rushing specialist role and it limited him to just 14 snaps. The good news though is he displayed plenty to suggest he can make a big impact in that role, displaying power on his bull rush to twice generate pressure on Charles Leno. An encouraging debut that will have Falcons fans excited for what is to come. It almost had the perfect ending as Glennon marched down to the Falcons with the game on the line. But he couldn’t get it done and while he was a safe pair of hands, he didn’t test a Falcons defense in the deep or intermediate areas. Just one throw went further than 20 yards and only four more went beyond 10 yards in the air. He’ll need to be more aggressive going forward. The Bears clearly think they’re onto something with the electric Cohen, who played a healthy 28 snaps and caused the Falcons defense fits. His devastating speed was on display as he turned a broken play into a huge gain and he’s going to become a big target so long as Glennon continues to throw check downs. How he reacts with teams paying him more attention will be something to keep an eye on. Hicks, making his first start for Atlanta, was licking his lips at the prospect of getting his hands on Wes Schweitzer. He had no problems controlling him at the point of attack in the run game and in the pass game was too big, too strong and too quick to be stopped as he picked up two sacks and one hit. The shame is he couldn’t keep it up in the second half as the Falcons adjusted, and after a second quarter roughing the passer penalty seemed to lose him a bit of his edge. Demps signed an offseason deal for a not-insignificant amount of money and the team would have envisaged more sure fire tackling than was on display. It started early and by the end of the game he’d missed three tackles, including a brutal stiff arm from Austin Hooper that let the tight end stroll into the endzone.